Donut Monster creates from-scratch donuts with unique flavours and high quality ingredients. 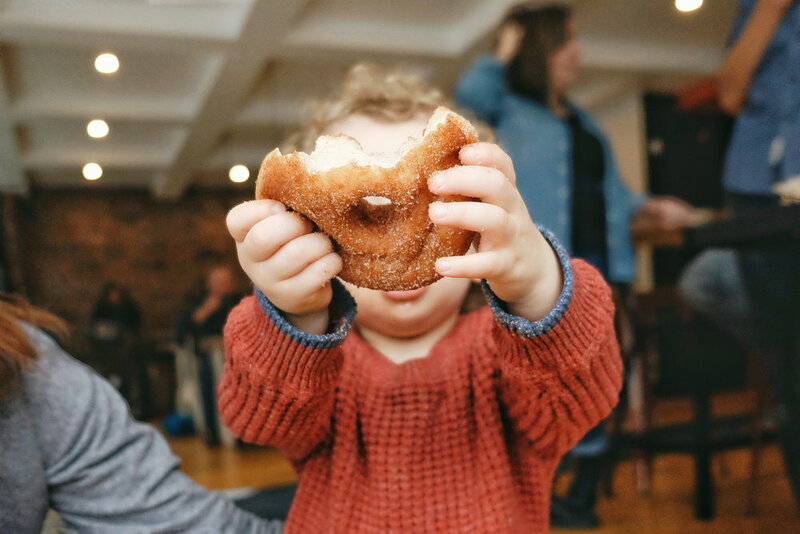 We started supplying Hamilton independent coffee shops and grocery stores with fresh donuts made at The Kitchen Collective in 2015. Our shop on Locke Street opened in 2018 and now our donuts are available seven days a week. The Donuts: Our yeast-risen dough is soft with a light chew. We pride ourselves on creating unique seasonal glazes and garnishes in combinations you may have never seen on a donut before. Our flavour menu is ever-evolving and we offer both vegan and traditional options. The Coffee: We serve a range of espresso based beverages and drip coffees from a selection of high quality coffee roasters. We also carry steeped teas from Monarch Tea Co. and a selection of great bottled cold drinks. The Milkshakes: Simple and flavourful vegan and traditional milkshakes. Choose from classic vanilla or chocolate - or try one of our unique seasonal flavours. Made with Hewitt’s Dairy or Rudy’s coconut-based vegan ice cream. 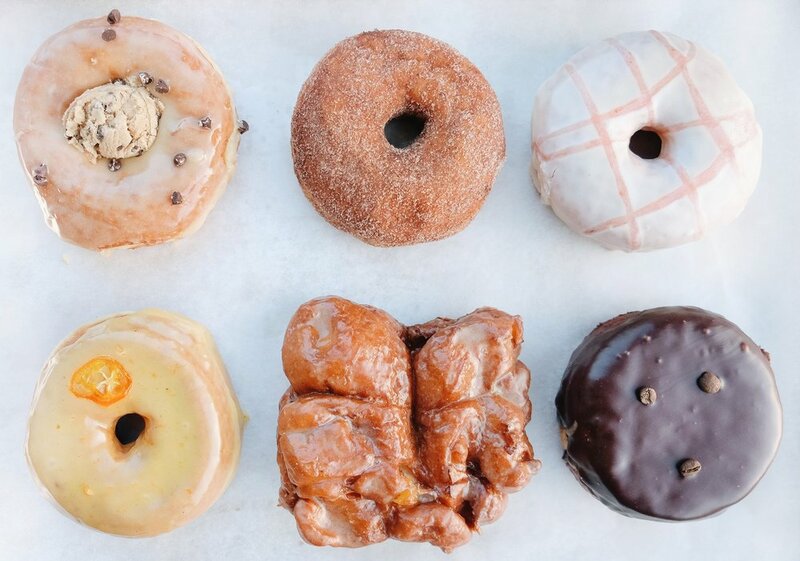 We also deliver exclusive fresh donut flavours to retail partners on Thursday, Friday, and Saturday mornings. Click here to find a location near you! We can provide a variety of donut options and flavours to fit any occasion. All made from scratch fresh on the day of your event! Our pre-order minimum is 4 dozen! We do pre-orders over four dozen by calling the shop at (289) 309-1108 or for six dozen or more by filling out the information form below. We can work with whatever display you have arranged. We offer customizable flavour tags with ingredient lists if that's helpful for your setup and we have a wooden multi-tier display available. We source our ingredients as local and fresh as possible so our flavour availability is based on seasonal cycles. This means, depending on the date of your event, we may not be able to accommodate specific flavours but there will always be plenty of options! We can work with you to create custom flavours that align with our seasonal product guidelines for an additional fee. We have a six dozen minimum for catering delivery - if your location is within the Hamilton area it's included in the cost. Any additional delivery fees will be evaluated on a case-by-case basis. Pickup at our Locke Street shop is always available. We find events often have their own unique needs which may influence final cost. Please email us below and we would be happy to provide an estimate. Please include what type of event, how many attendees, how many donuts and/or coffee you would like and any other important details you think we should know! Any general enquires can be submitted through this form. We are always accepting resumes for experienced bakers, enthusiastic baristas and those with strong leadership & management skills. Please apply by copying your resume into the form. Don't forget to tell us a bit about yourself and why you want to join the Donut Monster team! Please copy and paste your resume and cover letter here.